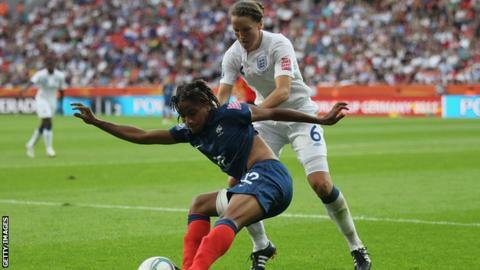 England captain Casey Stoney has welcomed the addition of friendlies against world champions Japan and Olympic bronze medallists Canada to a demanding build-up to July's Women's European Championship finals. Hope Powell's side, named the Club England 'Team of the Year' at the FA Awards on Sunday evening, will take on Canada - who beat TeamGB in the group stage of the 2012 Olympics tournament - at Rotherham on Sunday, 7 April. And they will face Japan, silver medallists at the Olympics after winning the 2011 Women's World Cup, at Burton on Wednesday, 26 June. "Canada and Japan are the perfect combination of opponents to play against in the build-up to a major tournament," said Stoney. "Canada are a physical, athletic team with some powerful players, while Japan are very technical and one of the best footballing teams in the world. "I think that Hope will have chosen Canada because of the defeat (as Team GB) we suffered against them at the Olympics. "They beat us fair and square, but we weren't outplayed and we were distraught to get beaten and lose our chance of getting a medal. "There were lessons to take from that game and we have a few things to prove to ourselves, so we will definitely be up for that game at Rotherham. "The same goes for Japan. They were deserving World Cup winners in Germany, but we beat them in our group with a brilliant performance and if we could do the same again it would give us a great boost going into the Euro finals." England kick off their Euro 2013 build-up at next month's Cyprus Cup, in which they will face Italy, Scotland and New Zealand in their group. Powell's team won the Cyprus tournament in 2009, beating Canada in the final, before finishing second to Germany at the Euro finals in Finland. Winning the Cyprus Cup again would be a good omen for Euro 2013, but Stoney is looking no further ahead than the Larnaca-based group stage. "We'll have a different challenge against each of the three teams, every game will be difficult," she said. "Italy are always tough opponents and New Zealand and Scotland have both come on massively in recent years - in fact Scotland beat us last time we played them, so we'll want to put that straight. "It's a really good build-up we've got to the Euros after a fantastic 2012. "Qualifying for Euro 2013 with a very good Holland team in our group was a big achievement, and of course the Olympics was just incredible. "The women's game was given a tremendous boost in terms of profile and acceptance among the general public thanks to the Olympics, and we've now got the opportunity to build on that by doing well at the Euros." In their group stage of Euro 2013, to be played in Sweden, England are set to meet Russia, Spain and France.